For the final touch after cleaning engine compartments, a light, even spray of Enigne Kote will result in crystal clear finish on all components. 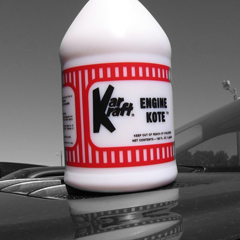 Produced with acrylic polymers, Engine Kote provides a flexible, watertight barrier that will not crack or discolor with age. Fire walls, engine blocks, fender wells, hoses and wiring are left with a long-lasting seal of protection. Electrical and ignition systems are sealed against moisture.